Across the cooler coastal and mountain forests of eastern Australia, a highlight for many wildlife lovers is to see the magnificent scarlet underside and red head of the male King Parrot (Alisterus scapularis). This species resides all the way from Cooktown near the top of Queensland to Southwestern Victoria. Australian King Parrots are sexually dimorphic, meaning it is easy to differentiate male from female King Parrots. Females have green feathers on their head, chest, with red feathers on the belly. They are a rather large parrot, measuring around 40cm or 16 inches. Interestingly, King Parrots can see ultraviolet wavelengths, due to the fact they have four types of cone in their retina versus humans having three. 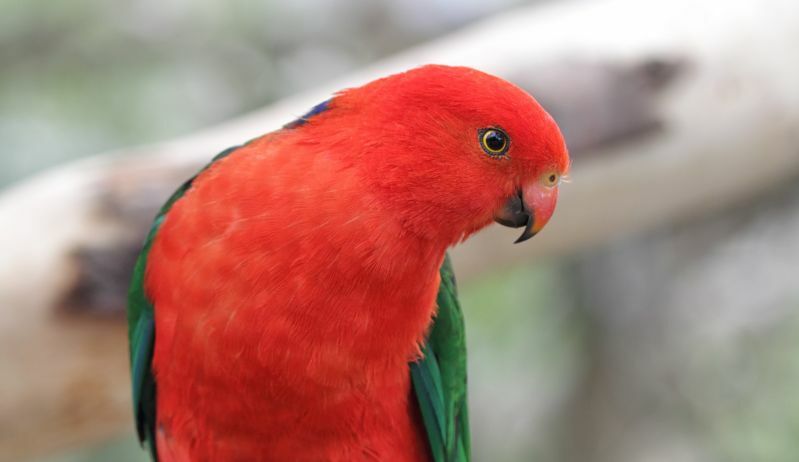 When viewed under UV light some of the wings feathers for the King Parrot appear yellow. 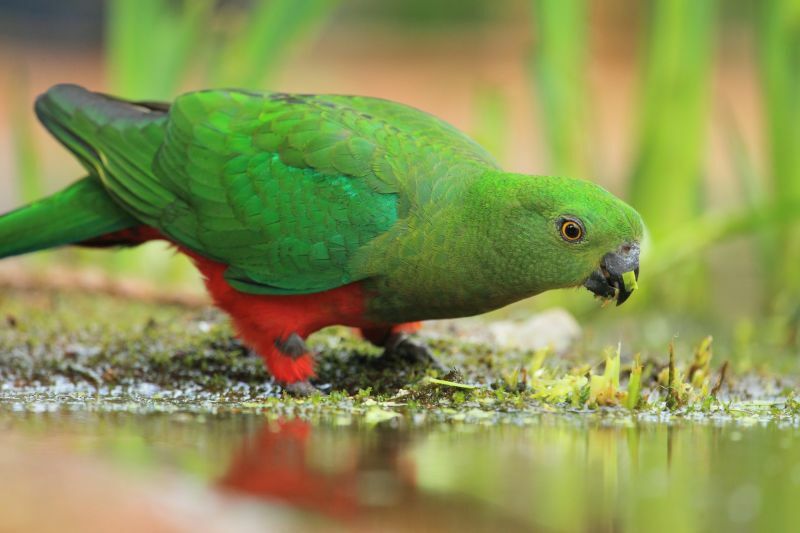 It is believed the ability to see UV wavelengths assists the parrot in finding prime nectar when they feed on flowers and possibly assisting them to navigate on cloudy days. Despite their vividly coloured feathers, the species can be rather elusive, as they prefer to dart through the dense forests with a rhythmic flap of their wings and characteristic quick turns between tree trunks. They will rarely fly above the tree lines and when disturbed, will often let out a loud screech. They also prefer to congregate in family groups or pairs. King Parrots nest in deep hollows of a tree trunk, with the entrance often being high in the tree (ten metres), but the nest base containing the eggs being close to the ground (half a metre). You might be forgiven for thinking that the King Parrot was named due to its amazingly vivid feathers and regal presence in the forest, however, according to “Australian Bird Names: A Complete Guide” by Jeannie Gray & Ian Fraser, the name King’s Parrot was proposed by George Caley to honour Governor Philip Gidley King (Governor of New South Wales from 1800-1806). In any case, the King Parrot is certainly deserving of its status as one of the most elegant and beautiful parrots found across Eastern Australia. Where can I see this species with an expert guide and what tour should I book?